Last week I invited my two "employees" over to my apartment for a work day. 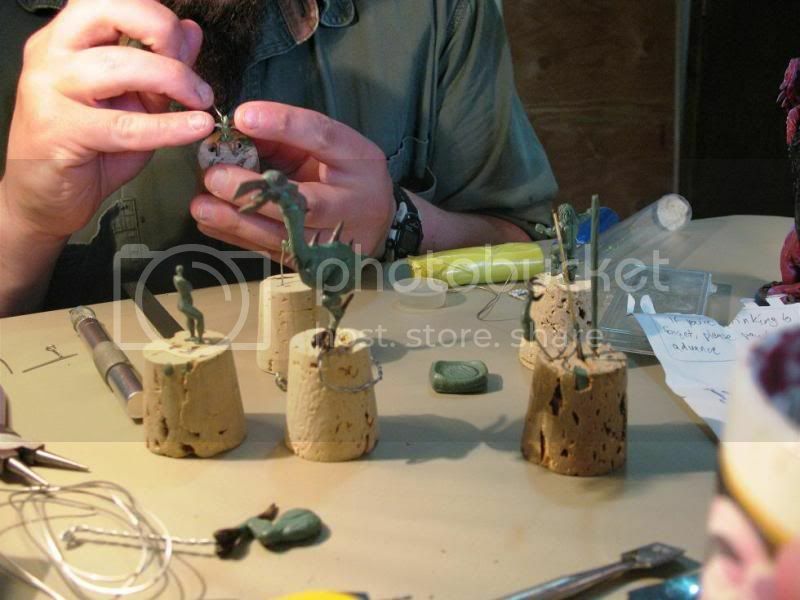 We've all got lives and jobs and other stuff to do, so sometimes it's hard to just sit down and work on hobby stuff. Tyson suggested that we all get together for a day where we go to work like Forge of Ice is a job. I loved the idea, floated it past Jack, he liked the idea, too, and we all figured out a day that'd work for us. Tuesday. Heh... 'employee' just sounds so wrong, and it's not technically really correct... they're 'artists for hire'. Tyson is one of my oldest friends, and Jack is a talented local converter and artist. 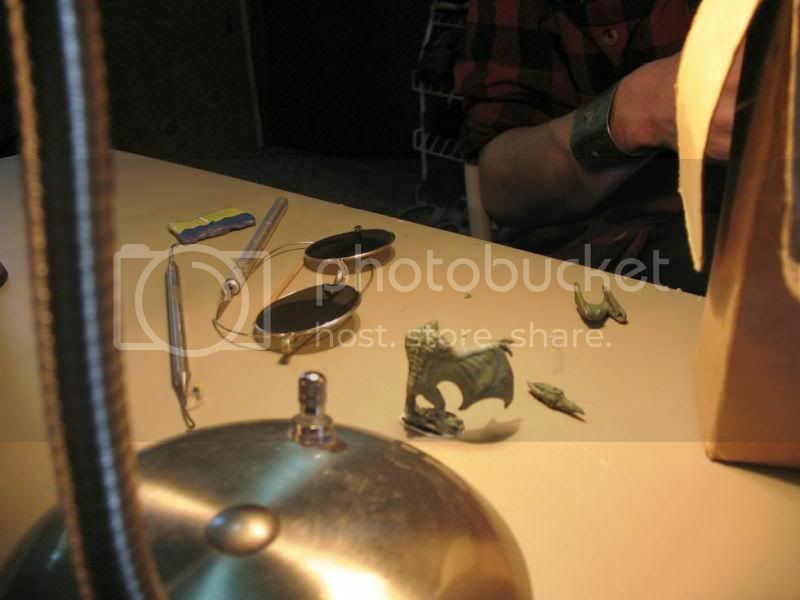 I asked him if he'd be interested in making a commercial sculpt for Forge of Ice, and he said yes! Also (a HUGE plus!) he's a chill guy that I get along with. That's Tyson on the left and Jack on the right. I had several goals with Forge of Ice, and one of the main ones was to have my favorite sculptors turn some of my ideas into reality - I got the wonderful Sandra Garrity to sculpt those peafowl for me. But another thing that I wanted to do was work with my friends, and also to find other talented people here in Fairbanks. There's a University here in the 'Banks, and I have a few friends and contacts in the UAF art department. 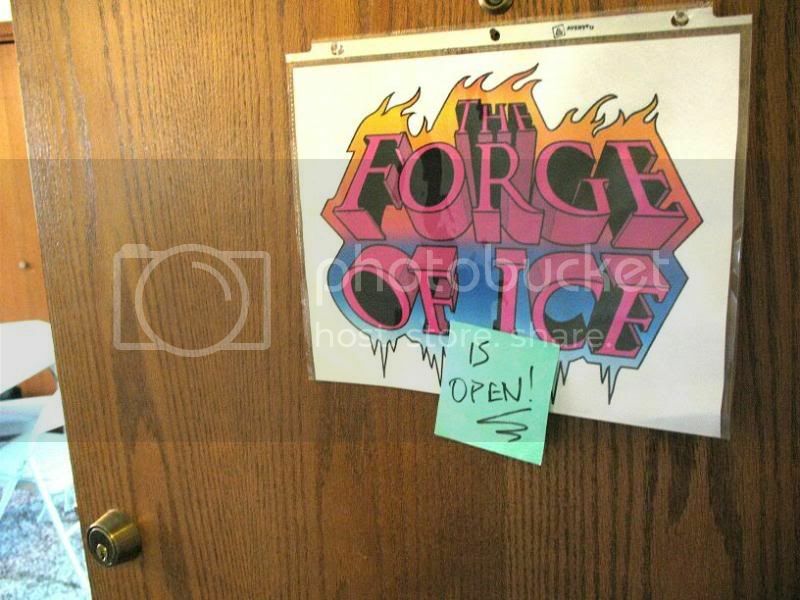 Peter Foglesong ( http://piotrov.deviantart.com/ ) is another of my oldest friends, and he made the Forge of Ice logo for me (and he's currently working on a few other things for me, too). Lucas Elliot ( http://bigfootillustrations.blogspot.com/ ) is someome that I was put in touch with through a mutual friend from UAF - he's finished a few pieces for me already, and is currently working on some other concept work for me. I looooooooooooove working with people who live here. If I had to call Sandra Garrity up to give her feedback, that'd just be too weird. But Tyson, Jack, Lucas? I can sit there and watch these guys work, look over their shoulders, and bug them. Without having any of the 'ohmigod you're a rock star' nervousness that I might have while talking to more established industry professionals. It's so much easier to do things in person than working by email - and little town in the middle of Alaska that we may be, there are many talented people here in this town, and I'm going to exploit work with as many of them that I can track down and trick convince (and afford) to work with me! It was a great day - we ordered Thai food (apparently it was Jack's first foray into the wonderful world of Thai cuisine - Drunken Noodles! ), did a lot of B.S. 'ing, a couple of my other friends dropped by to check out what we were doing, and on top of that we all made a fair bit of progress on our various projects! 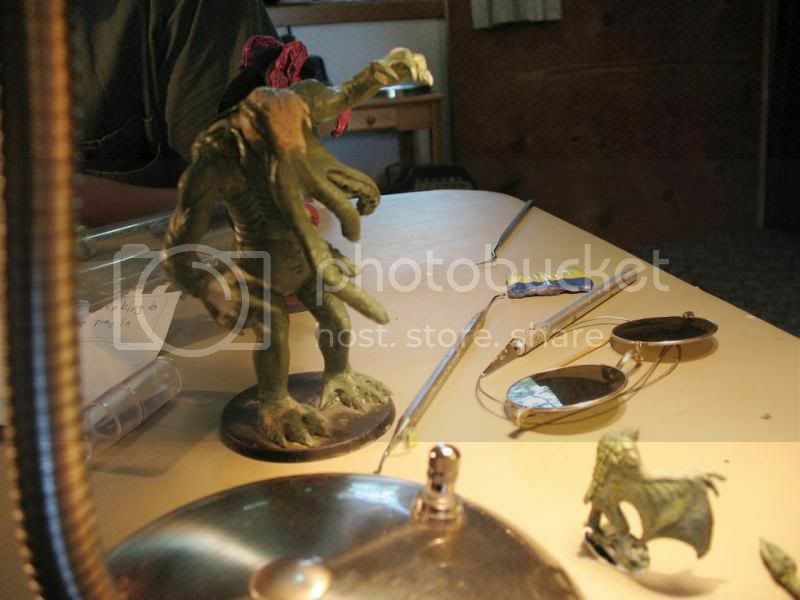 He's working on a few things for me (you can see the Mutant Terror Bird, mostly with skin, and FINALLY with arms, too. ), I think a couple of things for some other companies (his Cowboy Robot will be on Golgo Island at some point in the future - http://gangsofgolgoville.blogspot.com/2009/05/robot-cowboy-of-hell.html ), and a few things for practice and his own amusement. He did hand me two new finished sculpts - a small sherden shield to compliment the large one I've already got for saleand a new and improved skull bug. It's bigger than the earlier ones, too. I'll send them off to the caster in the near future. The two big guys are for his Tyranid army (I think), but from them you can see why I'd think that this guy had the chops to do professional work. 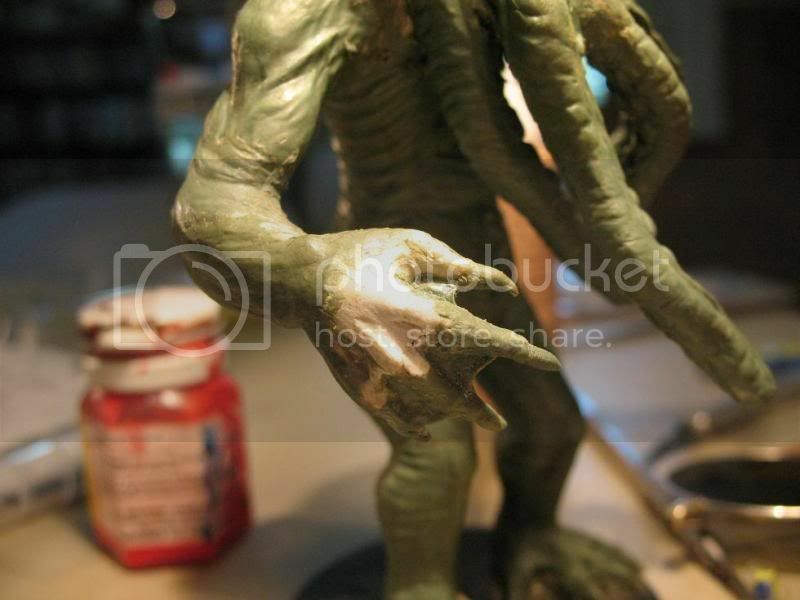 He did a bit of sculpting and painting on them while the Pterro-Man was in between steps. Myself I did a little bit of painting and converting on my ever-present Wargods figures, as well as some Reaper Cavemen to compliment my primitive tents, and a little display base for my Venus of Willendorf. So, it was a very fun and productive day! I hope you've enjoyed this little glimpse of my living room the inner workings of the Forge of Ice! We've already talked about it and will be doing 'work days' regularly from now on. Holy cow! Those figs are turning out great. 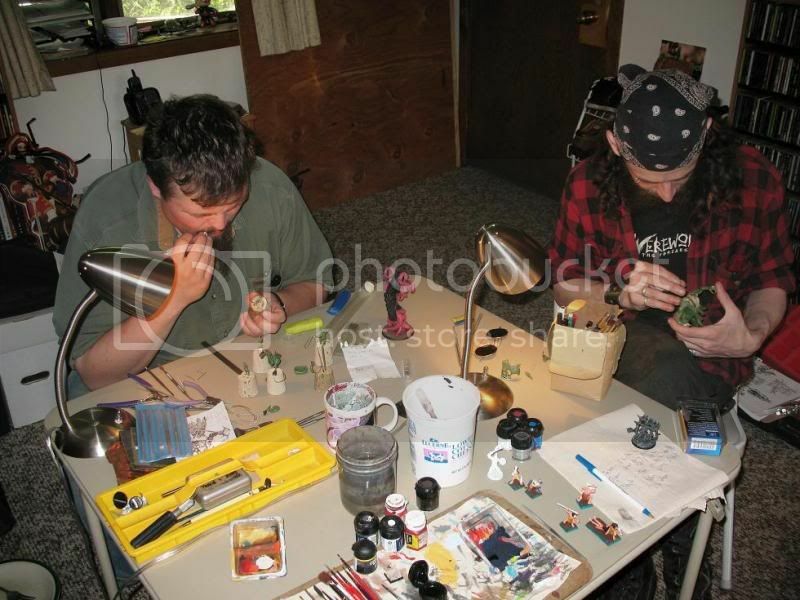 It is always great to sit down with fellow gamers and do hobby stuff. Even if it is just painting. 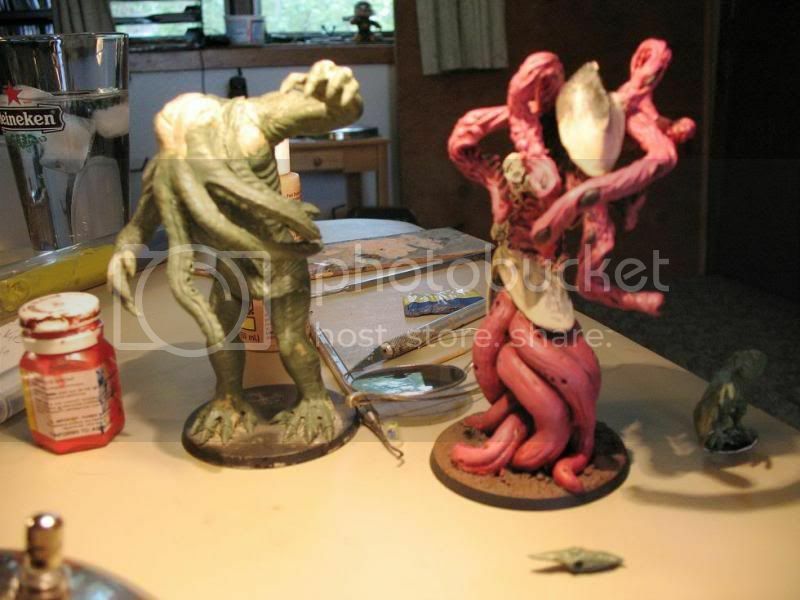 Oops, a correction - Jack's large models are envisioned as Chaos models (not Tyranids, as I mis-remembered). 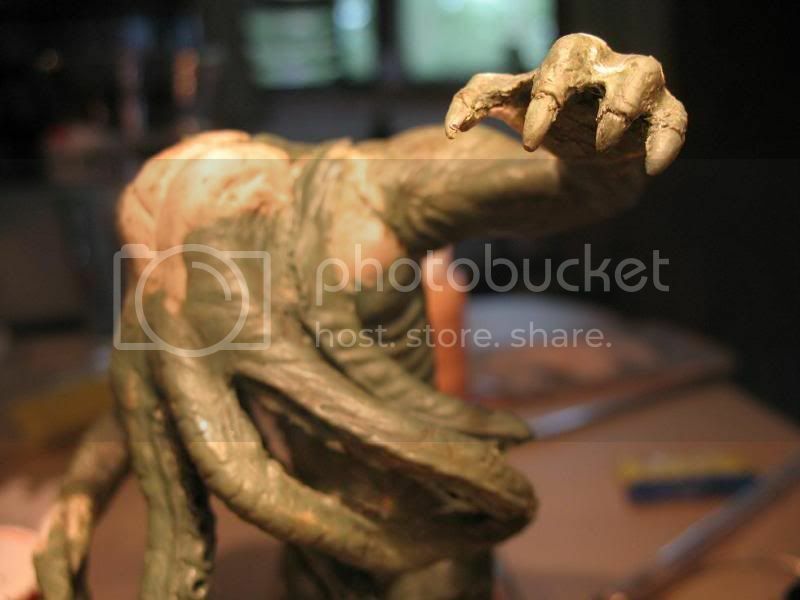 The Cthulhu creature is a commission piece for another local gamer, and the tentacle-y critter is named "Grin Maw", an experiment in sculpting tentacles. Great report. I wish I lived in Alaska. Hey, Joshua - my door is open if you should come north for a visit! 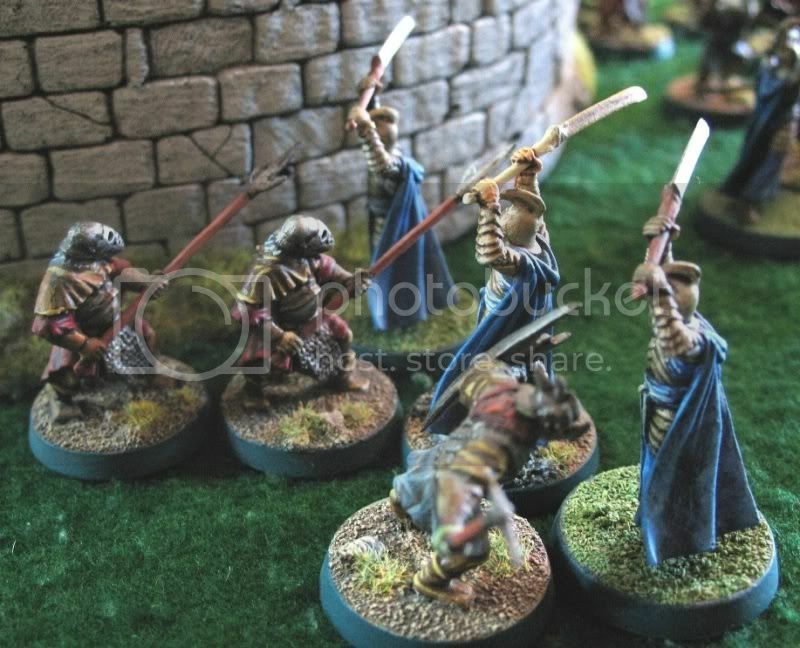 Elves versus Orcs - Jack's orcs kicked my elves' butts! While the Orc carried the day, I feel that the victory was largely decided by the whims of fate. My 'cunning' tactic of sneaking a few lads around the side practically back fired. If it had not been for Alex's turncoat dice I would have (and probably should have) been chopped up piece meal. It was the first taste I had gotten of the game other than having seen it played by other gamers. I got decidedly interested after seeing the dwarf ranger models. Alex was good enough to give me a demo of the game. I like that range of models. Sounds like a good day at the Forge. Alex, I need more updates....seriously....I'm not kidding. So, bid early and often! We're gonna have another work day next week - maybe I'll have some news to post then! Tyson is working on another Snapping Turtle shield, so you can give a little variety to your units, and Jack is making progress on the Pterro-man. There wa a huge Wargods tourney at Historicon. Looked like a great game and some good looking figures also.